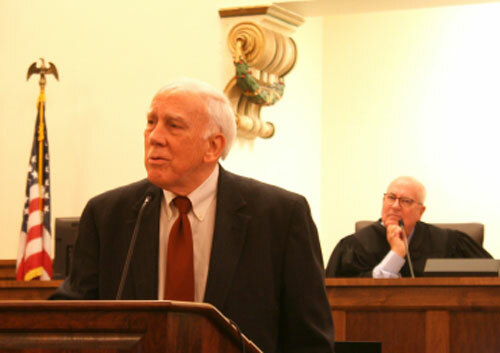 Mississippi Supreme Court Presiding Justice Jim Kitchens praised Pearl River County officials on Wednesday for forming the seventh full-time public defender office in the state. “This is the right thing to do. This is the epitome of the American way of life. People are on equal footing in the courtroom,” Justice Kitchens told about 65 people who gathered in the Circuit Courtroom in Poplarville on Feb. 21 to acknowledge the county’s milestone. Senior Circuit Judge Prentiss G. Harrell pushed to create the full-time public defender office to ensure adequate representation of defendants and save money for Pearl River County. Having a full-time office of three public defenders is expected to move cases more quickly to resolution, saving the county the expense of housing pre-trial detainees for many months. The county previously relied on three private practice attorneys who worked as part-time contract public defenders. Changes happened in increments. 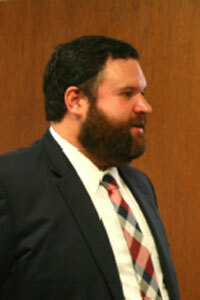 Public Defender Matthew Shoemaker became a full-time county defender in November 2016. Lindsay G. Watts joined the office full-time last year, and Frederick “Andy” Johnson joined the office in January. They have an office on the third floor of the Courthouse. Each has a caseload of about 125 people at any given time, Shoemaker said. “Everyone is entitled to a speedy and public trial. We want to uphold that right,” Shoemaker said. Judge Harrell has estimated that the full-time office will cost about $200,000 a year to operate. Justice Kitchens, who is chairman of the Public Defender Task Force, would like to see other counties move to full-time public defenders. “This is a beacon, a shining light for the state of Mississippi. I pray other counties will take heed,” he said. Judge Harrell and Kittrell also are members of the Public Defender Task Force, a 13-member body created by the Mississippi Legislature in 2000. The Task Force is tasked to comprehensively study needs by circuit court districts for state-supported indigent defense counsel, examine existing Mississippi public defender programs, and study approaches and costs of indigent criminal representation in other states. The Task Force also studies indigent defense in Youth Courts.